New Earrings and Statement Necklaces! A few weeks ago, I posted about a few jewelry pieces I added to my very small collection. I’m very happy to report that I have a few additions to add: two necklaces and two pairs of earrings. 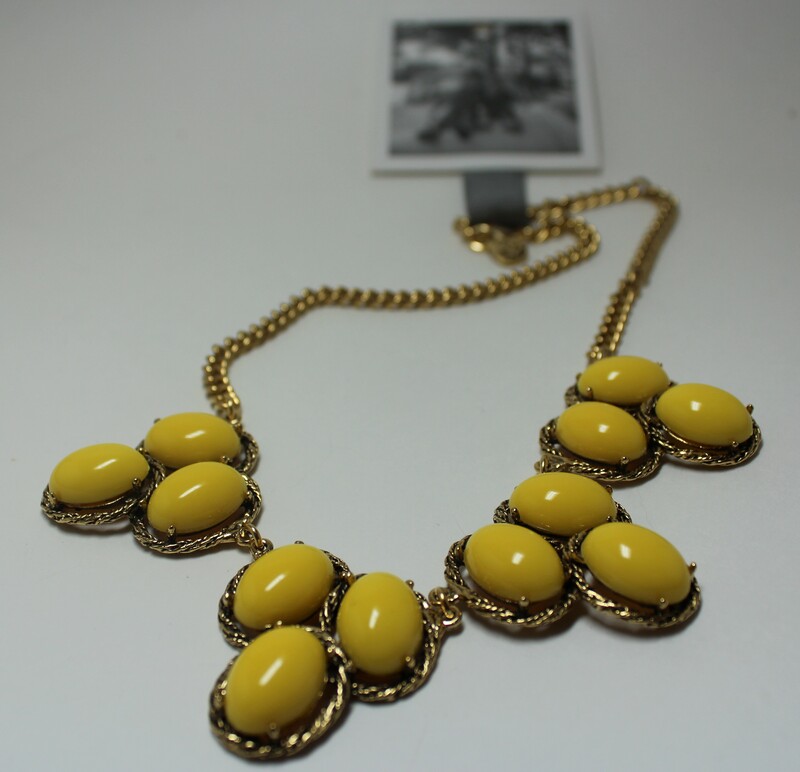 The top yellow necklace from Anthropologie was actually the first thing I have ever bought from the shop. I’ve tried on several dresses there, but I still had not pulled the trigger on anything, so I was excited. (The fact that I was shopping with my Anthropologie-loving friend may have had something to do with that. I tend to be influenced by my friends in my buying decisions when we shop together. Does that happen to anyone else or is just me?) The earrings and other statement necklace were on sale at JCPenney. I was able to purchase all four for only $63, which was quite a bargain! 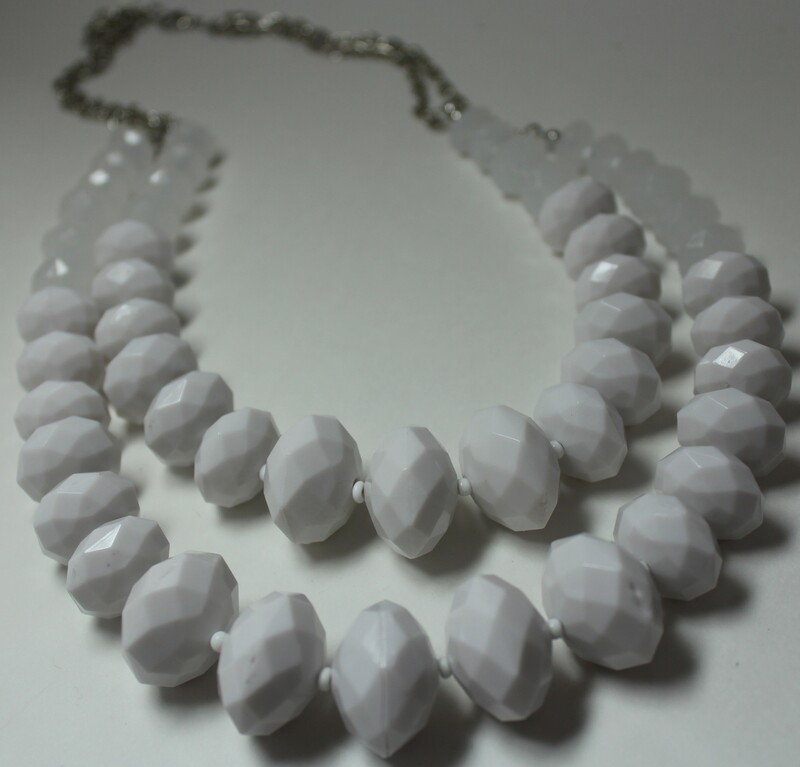 One of my main fashion goals to attain is to build up a decent statement necklace collection and I’ve been doing a great job. 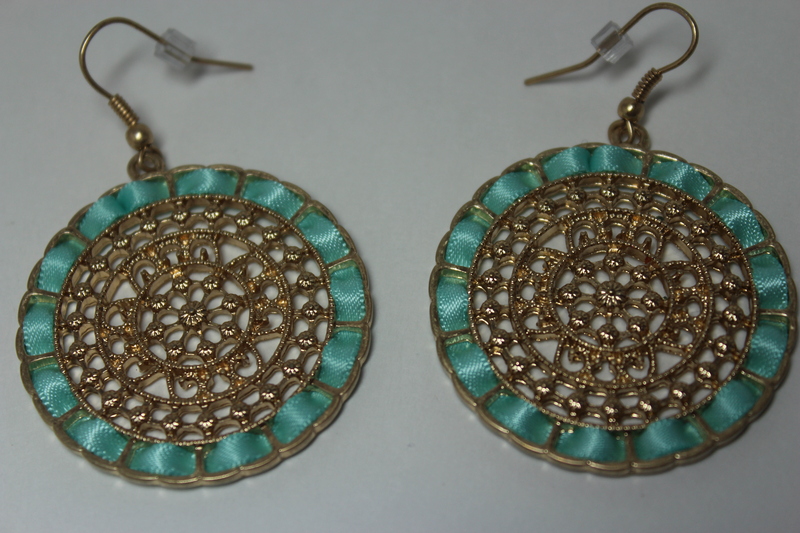 Next up are the earrings. I have an allergy to nickel and some other yet unidentified metal(s). As a result, I actually don’t currently have a single pair of earrings that I can wear without my ears getting red, puffy, and itchy. With the intention of systematically going through pairs of earrings to figure out what I am able to wear, I bought two pairs of relatively inexpensive earrings. 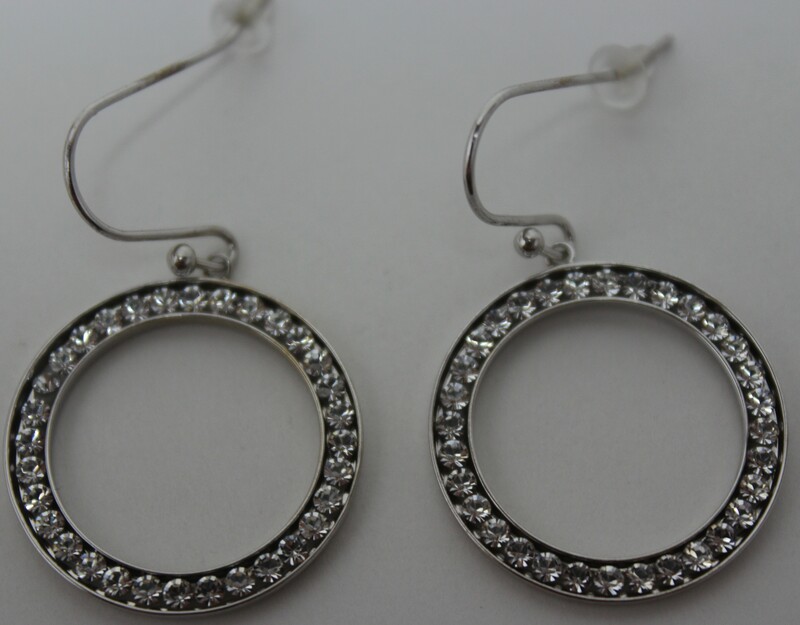 I hope I can find budget-friendly earrings that do not give me an allergic reaction so I don’t have to blow $$$ on pricey ones made of purer materials, like platinum or titanium. The $5 pair below has a 99% probability of giving me a reaction, but I’m more optimistic for the $20 pair, which is silver-plated. I decided it was high time to get on the Essie wagon to see what this nail polish was all about. So, I dropped $8 for the “Mint Candy Apple” color because I have been wanting to get mint polish for a long time. I finally cut my nails a few days ago and I found it way more difficult to paint my nails. But, short nails aside, I’m left not feeling very enthused about my newest polish. From the get-go, I could tell that the polish was thicker than usual, more reminiscent of my old nail polishes that are way past their prime. I don’t know if this bottle had been sitting on the Walgreens shelf for too long or if that is the normal consistency for Essie nail polish. Regardless, the thickness makes it really difficult to paint nails. The polish went on in thick, slug-like streaks and never dried smoothly after two coats. I’m left wondering if there is a certain technique you should use for Essie nail polish or if I actually have a bad bottle. Nail polish wearers: What is your experience with Essie nail polish? Do you like it? So, I’ve been shooting for getting back to 110 pounds since I was 15 years old and I am now 23. A few days ago, I just so happened to reach my goal right before a planned shopping excursion with my friend. Even though I had a pretty small spending budget, I decided to do something I have never done before: try on expensive dresses! The cheapest dress I tried on was $60, but that was the 30% sale price. The most expensive dress I tried on was $600 (I was almost too afraid to try it on after getting into the dressing room). 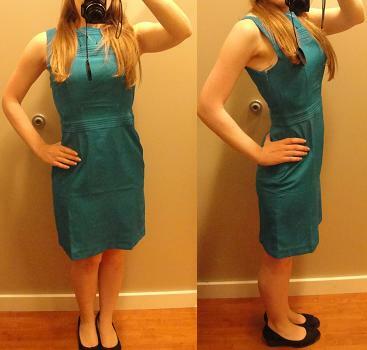 Throughout the entire day, I tried on dresses from Saks Fifth Avenue, Neiman Marcus, Theory, and Banana Republic. 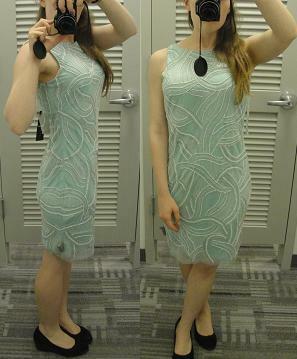 At Neiman Marcus, I tried on a beautiful Aidan Mattox dress in size 0. The 0 was the only size on the rack that wasn’t a 6 or 8 (sizes that I know are too big for me), so I decided that I would try it on. “This dress is so adorable,” I told my friend while waiting in line for the dressing room, “but it looks too small. I don’t think it’s going to fit me.” Imagine my shock when I slipped on the dress and it was not even a snug fit. There is extraordinary detail in the beading of the dress; it is absolutely stunning. Even though it hits just above the knee for me, I imagine the fit is intended for a few inches above the knee on a taller person. It’s tough being so short sometimes because mainstream clothes never seem to fit quite right! 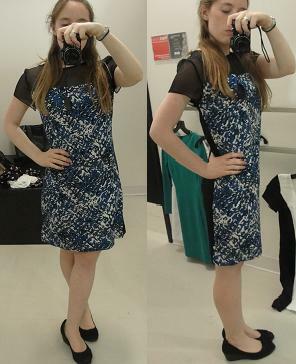 Another dress I really liked I found at the Saks Fifth Avenue store by the store brand Red in size small. The material was very flowy and comfortable, although I wondered if it was perhaps just slightly too big. If I purchased this dress, I would probably have to get it taken in a bit for it to fit me perfectly. Or perhaps it is supposed to fit exactly like this. It’s hard to tell, especially because this was not a petite-sized dress. I really like the design on the dress, the overall fit, the way it slims past my (wide) hips, and the blue, white, and black color combination. I’m also a big fan of the black sheer top part; nothing I currently own looks quite so unique. For some reason, I can imagine wearing this to a gallery opening or other similar evening event. I don’t remember the exact price, just over $100! We finally headed over to Banana Republic, which was our last stop of the day. I was overjoyed to find a small petite section with items that were really cute! 0P was the smallest dress, but there was a little extra material at my waist (notice the scrunched up fabric). There was no 00P to try on for comparison. I should note that this was my boyfriend’s favorite dress out of all of the ones I tried on, which is at least a little bit important. 😉 This dress was only $60 on sale and I probably would have bought it if I was not already purchasing a 0P black pencil skirt for work. $30 off the usual price is a significant discount! Overall, I would say that I had an extremely successful day shopping at this brand new outlet mall in my brand new size. It felt amazing to try on dresses and just enjoy myself while hardly even glancing at the price tag. If nothing else, this helped me figure out what size I am in different brands, as well as give me more motivation than ever to become established in a career so that I can dress as well as I want! Because I still haven’t gone shopping for new nail polish, I raided my little sister’s nail polish collection to find something eye-catching for my weekend out with friends. I decided on a glittery polish from Urban Outfitters. I love it! 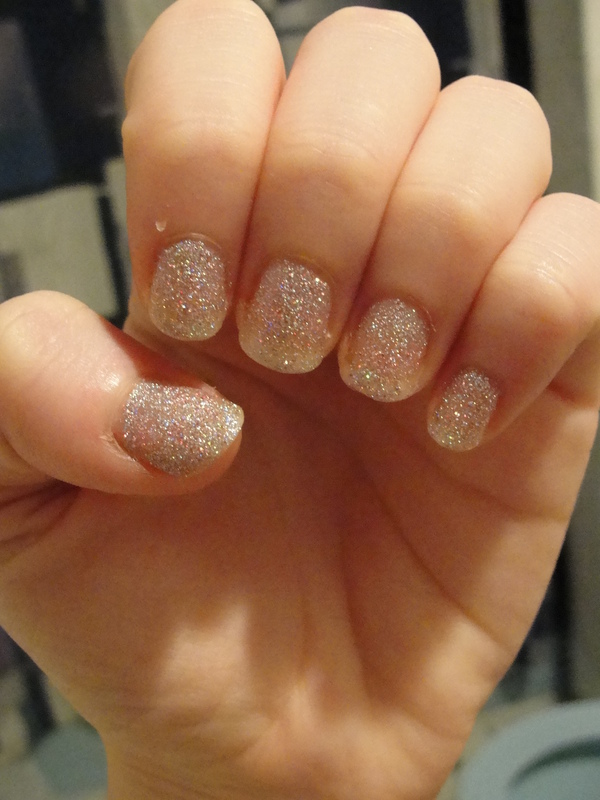 I haven’t worn glittery nail polish since I was in middle school, so it was refreshing to revisit this old favorite. What I love about this nail polish is that it’s flashy without being gaudy and the silvery color goes with pretty much any outfit! As far as I know, I won’t be having any interviews next week, so I can keep this on for a while. If you noticed the toilet in the bottom right corner, then…sorry I’m not sorry! I needed to get dressed for the night, so I didn’t have time for a proper picture. I hope you all have exciting weekends! It’s been a little over a week since I last painted my nails, so I decided to get to work! I never really enjoyed painting my nails because they never looked very good. I’ve gotten several manicures over the years, but I always wondered why my nails just didn’t look like my friends’. There were two reasons why: 1) I bit at my cuticles as a bad habit and 2) my nails were required to be kept short for playing the violin. I’m enjoying a short hiatus from violin for the first time in my life, so I figured now was the best time to enjoy painting my nails and letting them grow long-ish! Obviously, you can see the cuticle on my index finger standing out and the paint job isn’t perfect, but I’m still pretty proud. I have an interview tomorrow, so I’m glad I have freshly painted nails! 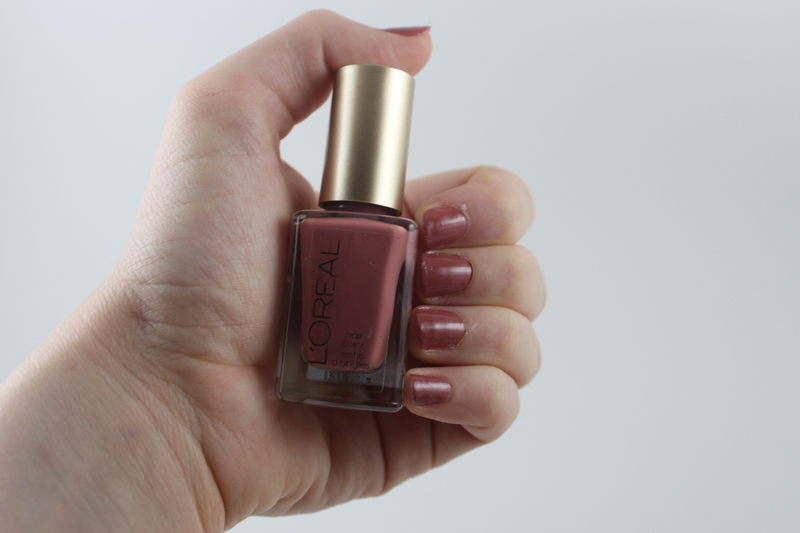 I’m wearing “Smell the Roses” by L’Oreal, which is from my local Walgreens for $6. I’m still testing out my lightbox and I know the lighting is a bit off, but I’m learning! My question to you: What brand of nail polish and/or color do you highly recommend? I can’t believe it’s been a full week already! Maintaining this blog has really helped to keep me motivated and held accountable for my goals, so I’m happy and very grateful to anyone who has liked or commented. You’re keeping me energized and I thank you. 🙂 If you’re curious, here is how I did last week. 1. HAIRCUT. (Beauty)I keep putting this one off because I’m very indecisive about what style I want. I usually just get a trim to get rid of dead ends with absolutely no styling. I also want to donate my hair to Locks of Love or Pantene, BUT I’m not sure my hair would be used because of those dead ends. Also, I would want to go to an expensive salon to get an awesome cut and styling, but I can’t afford that right now. Decisions, decisions. 2. When nail polish starts to chip, remove it and re-paint. (Beauty) I’m leaving this one on for one more week. I plan on re-painting tomorrow or latest Monday based on the faint traces of chipping now. I love painting my nails so much more now that I’ve grown out my nails more! 3. Early to bed, early to rise. (Health) I am seriously rocking this! Even though my summer job ended, I still go to bed by 11 PM and wake up at 7-something AM. This is going to stay on the list for at least one more week, though. This is a tricky one! 4. Brush twice and floss every day. (Health) I’ve made progress on this one, but I’m not ready to remove it from the list. I floss every day and I brush about every other morning (in addition to at night). 5. Write one-page journal entries. (Hobbies) I’m making progress on this, but I’m not quite there yet. My entries have been noticeably longer the past few days, but I still occasionally write and talk at the same time. 6. Submit three job applications. (Professional) I’ve been rocking this! I applied to a bunch of teaching jobs in one district, I was told I have an interview for next week that still needs to be scheduled, AND I went to a job fair. This one is probably not going to be removed until I actually get a job because applying always takes effort; it’s not second nature or a habit to apply. I’m upping the expectations here: three job apps! 7. Lift weights regularly. (Health) I did this three times last week with my five-pound weights. My arms are never sore the day after, but the most I’ve been able to do is fifteen reps at a time. I’ll go harder this week and report results! 8. Read Game of Thrones. (Hobbies) This is a book I started half a year ago, got to page 200, and put down because I was too busy with lesson plans. Now it’s time to finish it! 9. Do not bite cuticles. (Bad Habits) This one is going to be so tough, but I’m in it to win it. I’ve had this gross habit for way too many years! 10. Enter sweepstakes every day. (Novel Experiences) I should probably do this every day, even if it’s just for fifteen minutes, if I want a shot at winning something by my birthday. 11. Keep a food/exercise journal. (Health) I found a moleskine journal in my desk and started recording my intake and outtake on Tuesday. Let’s see if I can make this a habit! 12. Keep a positive things journal. (Personal) I started this one a few days ago. I was originally going to do a jar, but I figured the journal would be more space-efficient. Also, I would like to be able to see that one positive thing for specific days in the future, I imagine. (Drum roll): Here are the items I’m removing from my list! Note: Removing an item from my list means that doing the item has become a habit–almost something I don’t have to think about anymore. I just automatically do it. It certainly does not mean that I’m going to ignore doing those items anymore in lieu of new goals. If I slip up on any of the items I retired from my list, then they go right back onto my list the following week.